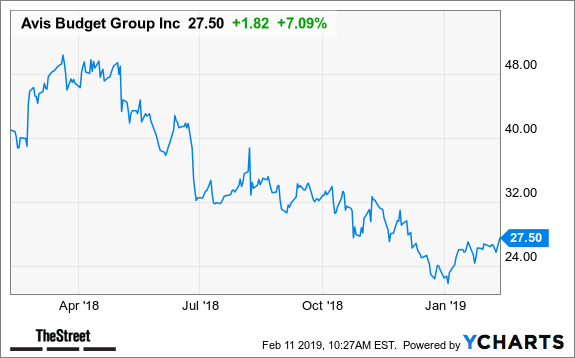 Avis Budget Group Inc. (CAR - Get Report) shares rose 7.4% in Monday's trading to close at $27.58, after Goldman Sachs analyst David Tamberrino upgraded the stock to buy from sell. Tamberrino also raised his price target to $35 from $30 Monday. The news caused trading volume to spike to 18 times higher than the company's 20-day average, at 1.39 million shares in morning trading, Bloomberg reported. Bloomberg estimates that figure to double to 3.71 million Monday. "We believe valuation looks attractive for mean reversion - currently trading at 6.2x our 2019E EBITDA estimate vs. a historical trough multiple of 5.9x and long-term average 8.4x - as most of the headwinds the industry (and the company) is facing appear priced in," Tamberrino said in a note to clients. The stock had recently been down 33.11% year over year. Shares lost nearly 50% in 2018, its worst full-year performance in about a decade. The company purchased Turiscar Rent-a-Car SA for an undisclosed sum on Oct. 3 2018. Avis releases its fourth-quarter earnings on Feb. 20. The stock has seven buys, one hold and one sell rating, according to Bloomberg.